Not to be confused with Gestapu, the 30 September Movement in Indonesia. This article is about the secret police of Nazi Germany. For other uses, see Secret police. The Geheime Staatspolizei (Secret State Police), abbreviated Gestapo (German pronunciation: [ɡeˈstaːpo, ɡəˈʃtaːpo] ( listen))  was the official secret police of Nazi Germany and German-occupied Europe. Wikimedia Commons has media related to Gestapo. 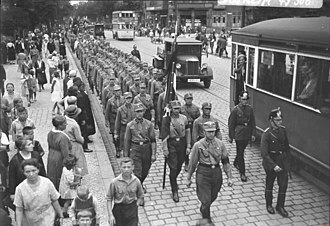 The Sturmabteilung, literally Storm Detachment, functioned as the original paramilitary wing of the Nazi Party. 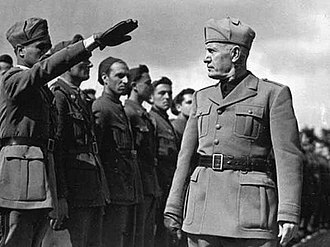 It played a significant role in Adolf Hitlers rise to power in the 1920s and 1930s, the SA have been known in contemporary times as Brownshirts from the color of their uniform shirts, similar to Benito Mussolinis blackshirts. The SA developed pseudo-military titles for its members, the SA ranks were adopted by several other Nazi Party groups, chief amongst them the Schutzstaffel, which originated as a branch of the SA before being separated. The SA became disempowered after Adolf Hitler ordered the purge of 1934. 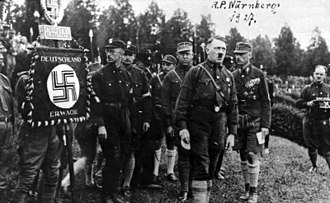 This event became known as the Night of the Long Knives, the SA was effectively superseded by the SS, although it was not formally dissolved until after the Third Reichs final capitulation to the Allied powers in 1945. The term Sturmabteilung predates the founding of the Nazi Party in 1919, originally it was applied to the specialized assault troops of Imperial Germany in World War I who used Hutier infiltration tactics. 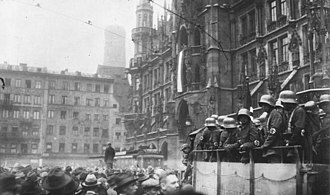 Instead of large mass assaults, the Sturmabteilung were organised into small squads of a few soldiers each, on 2 October 1916, Generalquartiermeister Erich Ludendorff ordered all German armies in the west to form a battalion of stormtroops. 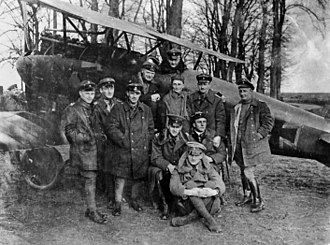 They were first used during the 8th Armys siege of Riga, wider use followed on the Western Front in the Spring Offensive in March 1918, where Allied lines were successfully pushed back tens of kilometers. 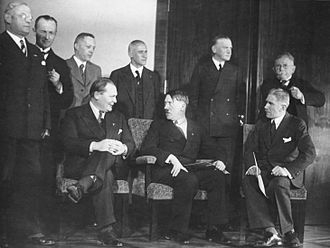 The DAP was formed in Munich in January 1919 and Adolf Hitler joined it in September of that year. 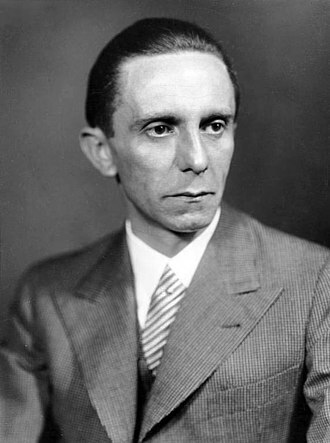 His talents for speaking and propaganda were quickly recognized, and by early 1920 he had gained authority in the party, the precursor to the SA had acted informally and on an ad hoc basis for some time before this. Some 70 people attended, and a second meeting was advertised for 13 November in the Eberlbrau beer hall. Some 130 people attended, there were hecklers, but Hitlers military friends promptly ejected them by force, the next year, on 24 February, he announced the partys Twenty-Five Point program at a mass meeting of some 2000 people at the Hofbräuhaus. 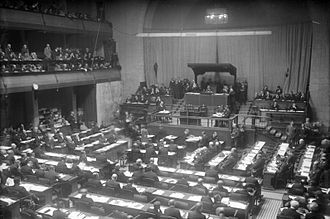 Marinus van der Lubbe was a Dutch council communist tried and executed for setting fire to the German Reichstag building on 27 February 1933, an event known as the Reichstag fire. 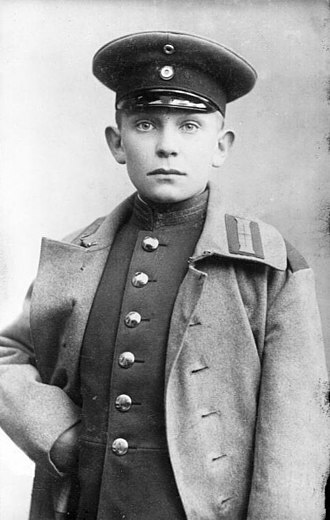 Marinus van der Lubbe was born in Leiden in the province of South Holland and he was born with learning difficulties. 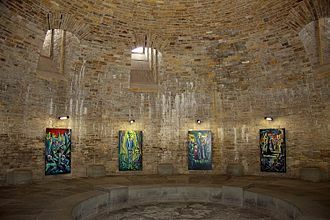 His parents were divorced and, after his mother died when he was 12, in his youth, van der Lubbe worked as a bricklayer. He was nicknamed Dempsey after boxer Jack Dempsey, because of his great strength, at his work, Van der Lubbe came in contact with the labour movement, in 1925, he joined the Dutch Communist Party, and its youth section the Communist Youth Bund. In 1926, he was injured at work, getting lime in his eyes, the injury forced him to quit his work, so he was unemployed with a pension of only 7.44 guilders a week. Not being able to live off this, he was forced to take occasional jobs, after a few conflicts with his sister, Van der Lubbe moved to Leiden in 1927. 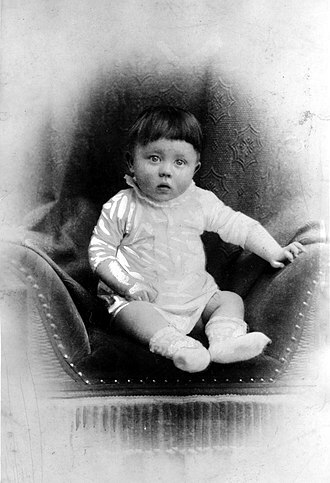 There he learned to speak some German and founded the Lenin House, while working for the Tielmann factory a strike broke out. During the trial, he tried to claim responsibility and was purportedly hostile to the idea of getting off free. 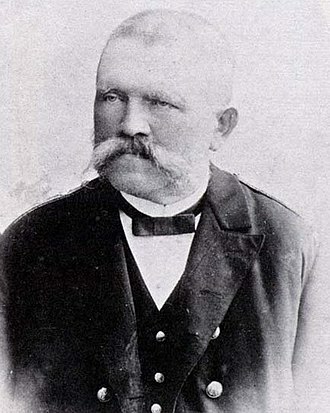 Afterwards, Van der Lubbe planned to emigrate to the Soviet Union and he was politically active among the unemployed workers movement until 1931, when he fell into disagreement with the CPN and instead approached the Group of International Communists. In 1933, Van der Lubbe fled to Germany to take action in the local communist underground and he had a criminal record for arson. 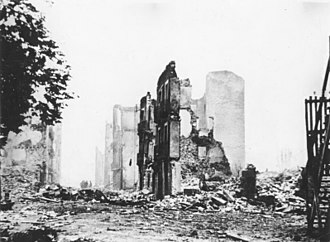 Van der Lubbe said that he set the Reichstag building on fire as a cry to rally the German workers against fascist rule and he was brought to trial along with the head of the German Communist Party and three Bulgarian members of the Comintern. 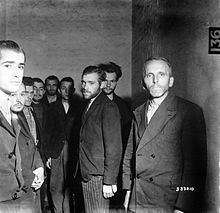 At his trial, Van der Lubbe was convicted and sentenced to death for the Reichstag fire, the other four defendants at the trial were acquitted. He was guillotined in a Leipzig prison yard on 10 January 1934 and he was buried in an unmarked grave on the Südfriedhof in Leipzig. Franz Josef Huber was an SS general who rose to the rank of SS-Brigadeführer und Generalmajor der Polizei. 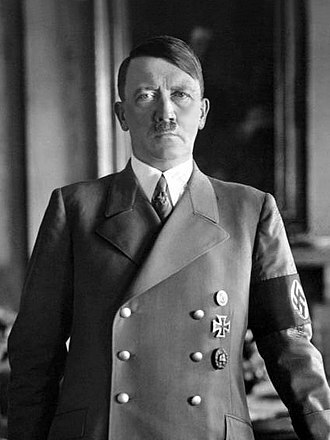 He was an official under both the Weimar Republic and Nazi Germany. 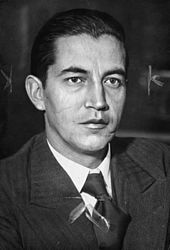 Huber joined the Nazi Party in 1937 and worked closely with Gestapo chief Heinrich Müller, after the annexation of Austria in 1938, Huber was posted to Vienna, where he was appointed chief of the Security Police and Gestapo for Vienna, the Lower Danube and Upper Danube regions. He was responsible for the deportations of Jews from the area, after the war ended, Huber never served any prison time and died in Munich in 1975. Huber was born on 22 January 1902 in Munich and he attended school through seven classes of gymnasium. In his last year of school, Huber served as a Zeitfreiwilligen which were units that could be mobilized on short notice by the army. In mid-1922 he entered the Munich police service and by 1923 was a auxiliary assistant, Huber was promoted to office assistant and by 1926 joined the political police department. In January 1928, Huber was made an assistant and a police inspector. During the years of the Weimar Republic he worked with Heinrich Müller, Huber was involved in the suppression of the Nazi Party and other political groups. 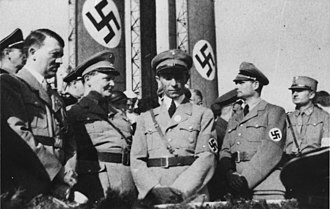 In 1933, Reichsführer-SS Heinrich Himmler became chief of the Munich Police and Reinhard Heydrich was commander of Department IV, the political police. 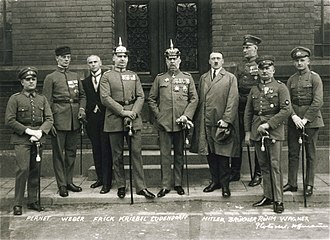 Heydrich did not dismiss Huber, Müller or Josef Albert Meisinger as he perceived correctly that these men were thorough professionals, Heydrich was appointed chief of the Gestapo on 22 April 1934. 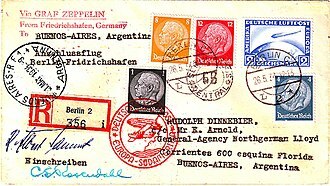 Immediately thereafter, Heydrich transferred to the Berlin office of the Gestapo, thereafter, in 1937 Huber joined the Nazi Party as member number,4,583,151 and joined the SS with number 107,099. 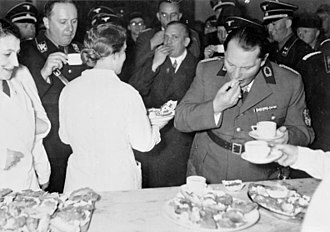 In early 1938 Adolf Hitler, Hermann Göring and Himmler wanted to dispose of Field Marshal Werner von Blomberg, meisingers investigation revealed that Blombergs wife, Erna Gruhn had been a prostitute with a police record and once posed for pornographic photos. 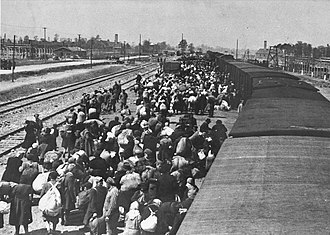 Sicherheitsdienst, full title Sicherheitsdienst des Reichsführers-SS, or SD, was the intelligence agency of the SS and the Nazi Party in Nazi Germany. The organization was the first Nazi Party intelligence organization to be established and was considered an organization with the Gestapo. 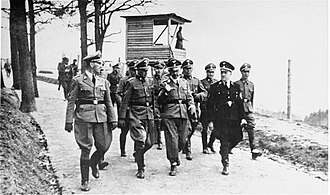 Between 1933 and 1939, the SD was administered as an independent SS office, after which it was transferred to the authority of the Reich Main Security Office, as one of its seven departments/offices. 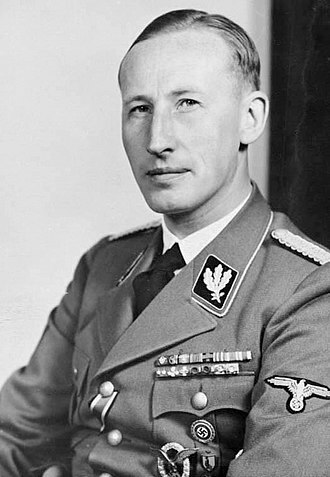 Its first director, Reinhard Heydrich, intended for the SD to bring every single individual within the Third Reichs reach under continuous supervision. 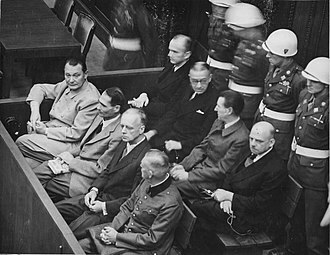 Heydrichs successor, Ernst Kaltenbrunner, was convicted of war crimes and crimes against humanity at the Nuremberg trials, sentenced to death and hanged in 1946. 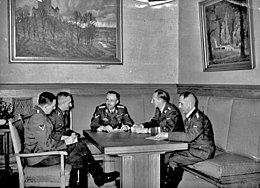 The SD was one of the oldest security organizations of the SS and was first formed in 1931 as the Ic-Dienst, operating out of a single apartment, Himmler appointed a former naval officer, Reinhard Heydrich, to organise the small agency. 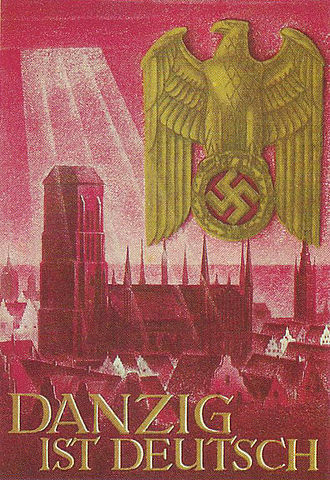 The office was renamed Sicherheitsdienst in the summer of 1932, the SD became more powerful after the Nazis took control of Germany and the SS started infiltrating all leading positions of the security apparatus of the Reich. 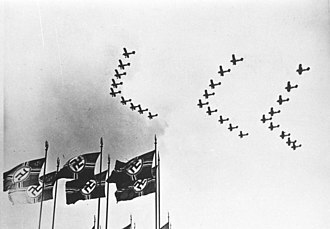 Once Hitler was appointed Chancellor by German President Paul von Hindenburg, Himmlers SS and SD made their presence felt at once by helping rid the regime of its known political enemies and its perceived ones, as well. As far as Heydrich and Himmler were concerned, the SD left their mission somewhat vaguely defined so as to remain an instrument for all eventualities, one of those eventualities would soon arise. 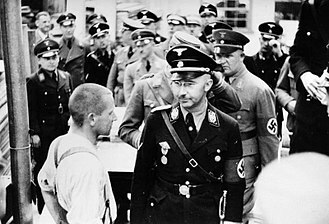 For a while, the SS was in ‘competition’ with the Sturmabteilung for influence within Germany, Himmler distrusted the SA and came to deplore the ‘rabble-rousing’ brownshirts and what they considered to be the indecent sexual deviants amid its leadership. 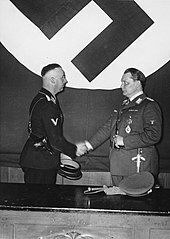 On 20 April 1934 Hermann Göring handed over control of the Geheime Staatspolizei to Himmler, named chief of the Gestapo by Himmler on 22 April 1934, continued as head of the SD. Thereafter, the SD was made the sole Party information service on 9 June 1934, reports were coming in to the SD and Gestapo that the vulgarity of the SAs behavior was damaging the party and was even making antisemitism less palatable. Moreover, the crushing of the SA and its leadership sent a clear message to everyone that opposition to Hitler’s regime could be deadly. 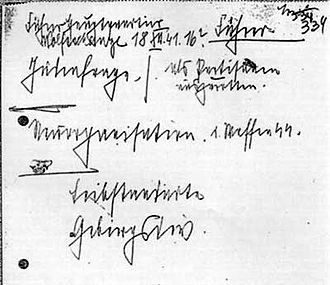 During the autumn of 1937, Hitler secured Mussolini’s support to annex Austria, nonetheless, to facilitate the incorporation of Austria into the greater Reich, the SD and Gestapo went to work arresting people right away using lists compiled by Heydrich. 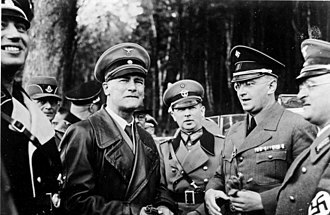 Heydrich’s SD and Austrian SS members received financing from Berlin to harass Austrian Chancellor von Schuschnigg’s government all throughout 1937, one section of the SD that was nothing more than a front for subversive activities against Austria ironically promoted “German-Austrian peace. 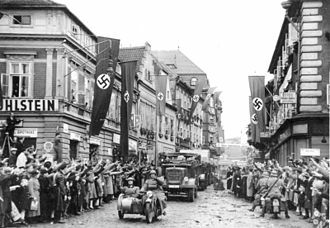 Once the annexation was official, the Austrian police was immediately subordinated to Heydrich’s SD, SS and the Gestapo. Later that morning, the organization declared that it was in control of media and communication outlets and had taken President Sukarno under its protection. By the end of the day, the attempt had failed in Jakarta at least. Meanwhile, in central Java there was an attempt to control over an army division. By the time this rebellion was put down, two senior officers were dead. In the days and weeks that followed, the army, socio-political, soon a mass purge was underway, which resulted in the imprisonment and death of alleged communists and communist sympathizers. Under the New Order regime, and sometimes used by the current government, from late 1950s, President Sukarnos position came to depend on balancing the opposing and increasingly hostile forces of the army and the PKI. His anti-imperial ideology saw Indonesia increasingly dependent on the Soviet Union, by 1965, at the height of the Cold War, the PKI penetrated all levels of government extensively. With the support of Sukarno and the air force, the party gained increasing influence at the expense of the army, by late 1965, the army was divided between a left-wing faction allied with the PKI, and a right-wing faction that was being courted by the United States. In need of Indonesian allies in its Cold War against the Soviet Union and this fostered a split in the militarys ranks, with the United States and others backing a right-wing faction against a left-wing faction overlapping with the PKI. In an attempt to curtail the right-wing militarys increasing power, the PKI, at around 3,15 am on 1 October, seven detachments of troops in trucks and buses dispatched by Lieutenant Col. Three of the victims, were killed at their homes. However his personal aide, First Lieutenant Pierre Tendean, was captured after being mistaken for Nasution in the dark, Nasutions five-year-old daughter, Ade Irma Suryani Nasution, was shot by the assault group and died on 6 October. In addition a police officer guarding Nasutions neighbour, Second Inspector Karel Satsuit Tubun, was shot, a final victim was Albert Naiborhu, General Pandjaitans nephew, who was killed during the raid on the Generals home. The generals and the bodies of their colleagues were taken to a place known as Lubang Buaya near Halim where those still alive were shot. The Reichstag building on fire. 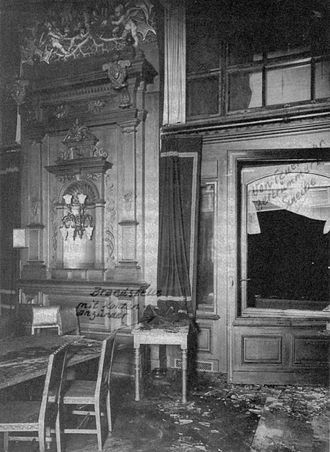 The window through which Van der Lubbe allegedly entered the building. Memorial at the Südfriedhof in Leipzig. The Army General Staff at the time of the coup attempt. The generals who were killed are shown in grey. Sign in New York City subway, reading “Penna.” for Pennsylvania, showing American style of including the period even for contractions. Franz Josef Huber (in doorway) with Heinrich Himmler, August Eigruber and other SS officers, at Mauthausen-Gusen concentration camp, June 1941. An automated Stasi machine used to re-glue envelopes after mail had been opened for examination.